Is this a bug or has some setting changed or been introduced? 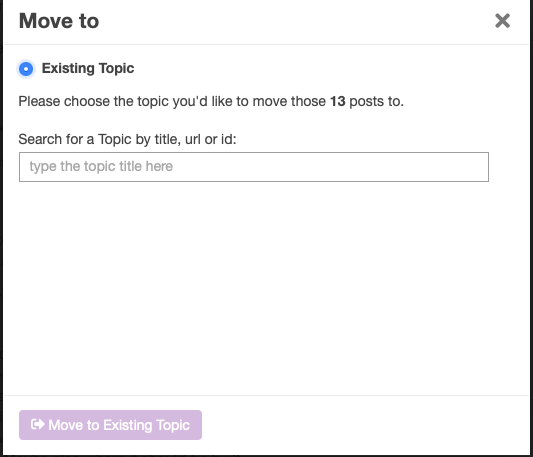 Did you select all posts within a topic, or just some? Hmm…the only way I can repro that screen here is by selecting all posts. Are you fully up to date? Are you fully up to date? Do you need me to check anything else before I move to new topic by selecting individually? Feel free to move them, I’ll do more testing on Monday. Thanks for helping to narrow this down! Are you still seeing this in v2.3.0.beta3? Looks fixed now, thanks Joshua.